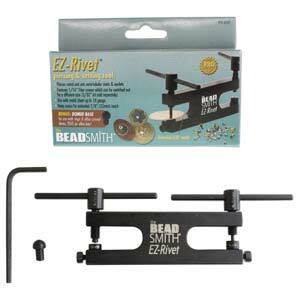 Pierce metal and set rivets easily with the EZ-Rivet piercing and setting tool from The Beadsmith. Not only does this tool pierce metal, it also sets semi-tubular rivets and eyelets. The domed base allows for use with rings and other curved items, allowing you to use this tool in a wide variety of projects. This tool is easy to use and will give your designs professional accents. This piercing and setting tool can be used with metal sheet up to 18 gauge. This product was added to our catalog on Monday 15 September, 2014.